Let’s talk about cherries. Here in western NC we all grew up with the standard pie cherry trees that grew in Grandma’s backyard. I have great memories of picking those tart cherries during the summer and being rewarded with my Grandma’s cherry pies. You just can’t beat those kinds of memories! Those memorable cherries were most likely Montmorency cherries, an old favorite that has been around for many years. It is a tart cherry and grows well in our climate. Montmorency is self-fertile so you only have to plant one to get a good harvest for you and the birds. Ripening in late June, this old favorite has a bright red color with yellow flesh and a tart, tangy flavor. Sweet cherries are a different story. Not as common in our area, sweet cherries can grow well here, nonetheless. Black Tartarian is a popular variety and is known for its almost black fruit and sweet, rich flavor. Ripening in early summer, it does need a pollinator of another sweet cherry. Bada Bing is great choice as a pollinator for Black Tartarian. 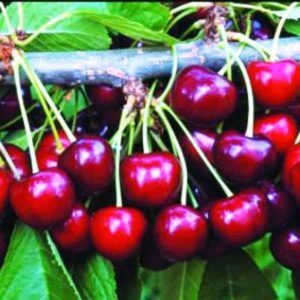 An improved variety of the famous Bing cherry, Bada Bing ripens in late June with a dark red skin and firm, sweet fruit. Because of the high sugar content, sweet cherries can split during hot or wet weather. Bada Bing is resistant to cracking which makes it a great addition to the garden. Just remember that you need 2 different sweet cherries for pollination. As with most fruit trees, cherries require annual pruning to ensure a good harvest. They also need a sunny, well-drained location and ample space. They are not dwarf trees. If you see some cherry pies in your future, any one of these trees would make a great addition to the garden. If you would like to add some cherry trees to your garden, they are available, along with other plants at our annual N.C. Cooperative Extension of Burke County small fruit sale (2019). To place an order or for more information, go to our website or call our office at 828-764-9480.